Our Faith, Our Planet, Our Responsibility. From a Green Jobs Fair at Mt. 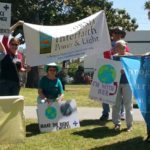 Zion Missionary Baptist Church in West Oakland to an interfaith tent at Lake Merritt, participation in climate marches in Wilmington, Sacramento, Oakland and San Diego to an Earth Fair at Sacramento’s Trinity Cathedral 2017 reveals a persistent and diverse spiritual and religious witness for the earth in the Golden State. 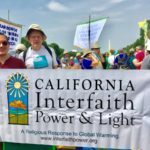 California Interfaith Power & Light’s climate-mindful member congregations and partnering regional action networks are expressing the grief, fear, hope, resilience, strength, and visionary wisdom within our faith communities and us. 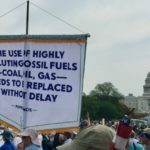 Whatever goes on in Washington DC, California’s faith communities are resolved to advance meaningful climate action, cut pollution and forward a clean energy agenda. In Southern California, CIPL began the year with action in the South Coast Air Quality Management District (AQMD). Alongside a coalition of public health, equity, and environmental groups, CIPL pushed for a stronger Air Quality Management Plan (AQMP), which is revised every four years and provides guidance on AQMD policy for mainly statio nary sources of pollution. In the January AQMD Board meeting, staff included a moment of silence in its public comment period, for all the persons who suffer as a result of polluted air, and for the estimated 5,200 persons who will die each year from pollution-related causes. CIPL was present again at the February Board meeting, in which the Board was scheduled to vote on the AQMP and, instead, put off the vote when faced with five hours of public testimony and a rally outside its headquarters. In its vote at the March 3 AQMD Board meeting, the AQMP was passed with two important amendments – greater monitoring of emissions at airports and a sunset date for the RECLAIM program. CIPL also continues to partner with Repower L.A., which provides training for and placement in jobs at the Los Angeles Department of Water & Power. One of the most creative jobs initiatives in the country, Repower L.A.’s model recruits workers from Los Angeles neighborhoods struggling with high unemployment and pollution. The program is currently working to expedite job placement and grow community engagement in household weatherization and incentive programs. In Northern California, CIPL staff, member congregations, and clergy spoke before the Bay Area Air Resource Board giving the moral case for strong local pollution reduction standards and in support of clean energy jobs before the Alameda County Board of Supervisors. In early February, CIPL held 10 meetings in the Central Valley with clergy, faith leaders and organizations, mostly in the Fresno area. Environmental injustice is visibly evident in the Fresno region and pollution challenges in West/Southwest Fresno stand out in comparison to East/Northeast Fresno. The informative and eye-opening conversations provided insight and direction for an event CIPL will be co-hosting with the Roman Catholic Archdiocese of Fresno on May 22. This gathering will seek to lay the groundwork for more faith engagement in the struggle for climate justice in the region. On February 15, CIPL staff attended Green California’s Annual Conference. This year, a large portion of the conference focused on on-going implementation of Climate Investment legislation in disadvantaged areas, transportation, and water. Dolores Huerta, co-founder of the National Farm Workers Association and civil rights activist, inspired the crowd in her keynote address. On February 18, CIPL took part in a “Day of Dialogue” at UU Neighborhood Church in Pasadena. This event focused on finding common ground and ways to support partner organizations, which sometimes have different approaches and strategies in fighting climate change. A common theme among all the organizations was a focus on disadvantaged communities as well as resource and information sharing. In late February, CIPL staff member Allis Druffel provided support to the Los Angeles Catholic Archdiocesan Religious Education Congress. In her role with CIPL and as chair of the Archdiocesan Green Team, she developed a handout – given to some 10,000 Catholics – with a list of energy efficiency, climate advocacy and educational resources, many of them formulated around Pope Francis’ encyclical on ecology. 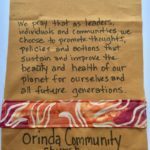 The handout was part and parcel of the 2017 Congress “Sacred Space”, an area for attendees of the four-day conference to pray, center, and reflect on caring for our common home. March witnessed an important gathering of the California Air Resources Board (ARB) meeting in Riverside. The ARB, which adopted its ZEV (Zero-Emissions Vehicles) Mandate in 2012, was faced with the decision to continue it through 2025. Many of the large automakers, shortly after the new administration came on board, wrote a letter stating that the 54.5 mpg standard by 2025, adopted by the Obama administration, was too onerous and could not be accomplished. California has a waiver from the federal government to keep these in place. After almost four hours of testimony, in which 75% of the comments were in support of the ZEV Mandate, the Board voted unanimously to keep the standards in place. Going several steps further, ARB Chairman Mary Nichols openly scolded the automakers for ‘throwing themselves at the mercy of the new administration.’ Board members repeatedly reminded the auto industry that the technology and know-how exist already, the EV infrastructure is increasing, and that electric vehicles must be advertised and made available to all parts of the country, especially areas in which there is a noticeable lack of them currently. 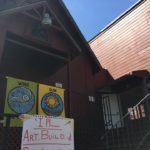 This spring in Northern California CIPL st aff spoke at the Contra Costa Interfaith Climate Action Network’s advocacy training, at the Interfaith Council of San Francisco’s monthly breakfast, and at Sleepy Hollow Presbyterian Church. 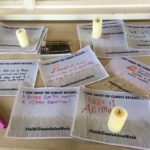 Throughout April and during Faith Climate Action Week especially, CIPL member congregations hosted educational forums, Earth Day fairs, and made prayer flags for the People’s Climate March. From April 24 th – 27th CIPL staff joined colleagues from IPL affiliates across the country from 37 states for our annual conference, which was held at Bon Secours Center, a Catholic retreat center in Marriottsville, Maryland. The gathering provided a valuable opportunity for Interfaith Power & Light leaders to consider together our organization’s future as our Founder & President retires and the search begins for a new one. California IPL staff also attended a workshop hosted by Minnesota IPL focused on organizing strategies, including the importance of narratives and storytelling as a key component for transformation and action. As we do each year while in the Washington, DC area CIPL staff and advoc ates made legislative office visits on Capitol Hill meeting with 32 House offices and both Senate offices. We urged full funding for the EPA and passage of the Nonpr ofit Energy Efficiency Act; and urged Senators to oppose a Congressional Review Act passed by the House Majority that would undo important methane leak reduction efforts. 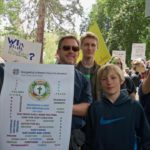 An overall message was that this is a crucial time for the health of our planet and that actions by the Obama Administration must be strengthened. There was an increased, palpable sense of urgency in the meetings. In all meetings with Republican offices, members were urged to embrace clean energy, clean energy jobs, racial justice and to join the Bipartisan Climate Solutions Caucus. 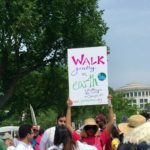 CIPL members, staff, and supporters were out in full force for People’s Climate March and Science March. 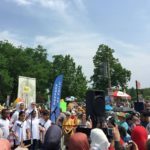 In addition to lending its support to several state marches, a strong faith presence was evident at the DC Peoples Climate March. 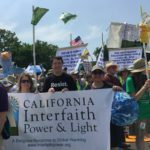 California Interfaith Power & Light staff attended People’s Climate March’s in Wilmington CA and Washington DC while member congregations and regional working groups attended marches in Oakland, Sacramento, and San Diego. The Oakland march included an interfaith service led by three CIPL member congregations, Kehilla Community Synagogue, Montclair Presbyterian Church, and the Islamic Center of Northern California. Thousands in Wilmington gathered at Banning Park to network, build relationships and gather inspiration for the work ahead. With a primary focus on an on-going campaign to defeat a proposed merger of the Tesoro Oil Refinery and BP Carson to create the largest oil refinery on the West Coast. In the march from Banning Park to Tesoro, activists sang, chanted and held signs up to the community and motorists. At the oil refinery itself, members of indigenous communities held a healing ceremony with incense and dancers in traditional regalia. 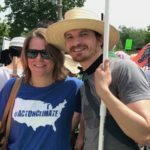 The feeling of connection and community spread palpably among the attendees and only served to strengthen resolve for the switch from dirty-burning fossil fuels to a clean energy future. 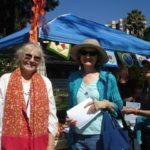 The work continues, please consider a special spring gift to support CIPL’s ongoing mission of lifting the moral voice in California for climate action.